Holidaymakers are less likely to encounter a Basil Fawlty-style hotel in Finland than anywhere else in Europe, a new study has suggested. 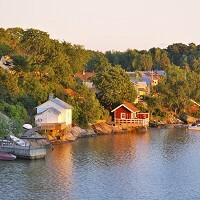 The Scandinavian country heads a league table for polite hotel staff and good service compiled from a survey conducted by the accommodation booking website Hotel.info. No holidaymaker can insure against impolite service. But they can insure against most unexpected holiday hiccups, such as emergency medical cover, luggage and money, travel delays, personal liability and legal costs, by booking trusted travel insurance. The Hotel.info poll found hotel staff in the Nordic countries, Germany and eastern Europe to be the best mannered, with Russia and Denmark among the least welcoming. Seasoned travellers to Finland already revel in its promise of beautiful lakes, mountains and wild beauty, and winter wonderlands such as Lapland. But new visitors to one of Europe's most northerly countries should also expect an equally enticing welcome from accommodation personnel, according to the survey. This is offered across the nation, from the bustling capital of Helsinki to regional hotspots such as Turku and Tampere. Finland scored the highest rating of 8.38 out of 10 in Hotel.info's table of the leading 20 European countries. This was based on the approachability and expertise of hotel employees through the opinions of customers who have booked hotels via Hotel.info's website. Categories included room quality and value for money, besides staff friendliness. Hoteliers in Denmark and Russia did not fare so well, however. They scored so badly on the friendliness of hotel staff that they languished outside the top 20. Russia (7.66 out of 10) and Denmark (7.7) were among the worst-performing countries.